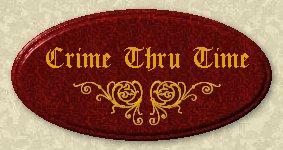 Crime Thru Time is a web site dedicated to Historical Mysteries. information about upcoming releases, series/author book lists, timelines, and links of interest. Note: This is NOT a Historical Fiction site. Library houses pages and pages of history mystery book lists, along with links to Author Web Sites. Book Club displays all past and future books chosen for our monthly voluntary read, along with a link to possible future selections. Discussion is the place to find information about joining our discussion list. We discuss all things historical mystery on the list: including web sites, books, authors, and history. Reviews Reviews of historical mysteries on our sister site myshelf.com are added regularly. There is contact info on the page for anyone wanting a review by myshelf.com reviewers. Timeline is a listing of when and/or where a HM book/series takes place. The page also has a link to the *This means war* war timeline. Releases is a month by month listing of newly published historical mysteries. While we do our best to keep it current, update information from others is welcomed. Bookcovers lists bookcover illustrations we are seeking to complete the library lists. Links (other than author web pages, which can be found in the Library) dealing with historical mystery subjects can be found on this page. Webmaster is a link to email the webmastes with comments, complaints, corrections or updates to the site.